The diet of a racing greyhound includes high bacteria food (raw 4-D meat). 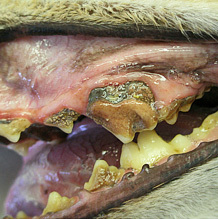 This bacteria-laden food easily forms tartar and plaque on a greyhound's teeth which, if not removed, will push back the gum lining exposing the root. Ultimately the bacteria will then enter the dog's bloodstream and system and can affect the heart, liver and kidneys. A root-exposed tooth is a problem. It has no enamel covering and contains tiny rough pores that attract plaque and tartar and bacteria. No matter how clean the tooth, bacteria will still build up. 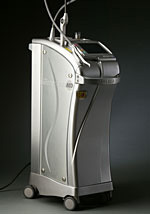 NGAP uses a laser to seal those tiny pores making plaque and tartar less attracted to the site. A clear bonding finish is then applied to replicate an enamel surface. Once this procedure has been done, there is significant reduction of tartar build-up in the future. The gums remain healthy and there is no further root exposure. 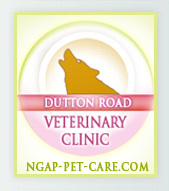 NGAP addresses all dental issues and ultrasonically cleans all greyhounds' teeth prior to adoption. We also administer two doses of the Porphyromonas Vaccine, marketed by Pfizer Animal Health to help promote better canine dental health and prevent periodontal disease. Porphy booster shots can be given after your dog's teeth are cleaned and should then on an annual basis. 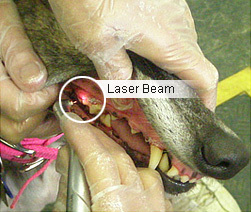 Your greyhound's dental care is an important health issue that you can have full control over. As its owner, it is your responsibility to maintain your greyhound's teeth and mouth. Daily brushing is essential to the health of your dog. Once a month, inspect your dog's mouth for tartar. Tartar is a thin brown line along the gum line. There should not be a "ledge" between the gum and the tooth. Your greyhound's gums should also be a nice pink color. Be on the lookout for inflamed or swollen gums or bad breath. Pet stores sell soft bristle brushes, finger brushes and toothpaste especially for dogs. Crunchy treats also help to keep teeth clean. Nylabone company offers several chew toys to help keep teeth clean. Professional cleaning and polishing, using the ultrasonic method, is a must and should be done at least once a year. 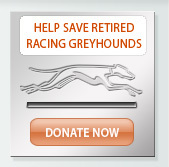 Ultrasonic cleaning can be done successfully on most greyhounds without anesthetics. This procedure is called a 'touch-up'. Although a touch-up is not as thorough as a full dental cleaning, it may be satisfactory, depending on condition of your dog’s teeth. If anesthetic is needed, and no major dental work is necessary, your dog should be ready to go home within 5 minutes after the cleaning. After your greyhound’s teeth are professionally cleaned and polished, you can use various other products to help maintain their teeth. Oxyfresh and Biotene Water Additive are two products you add to your dog’s drinking water to reduce bacteria in their mouth. Both products are colorless and odorless and are available through the NGAP office as well as from the clinic. Pro V Seal is a product that you apply to your dog’s teeth forming a slippery wax-like film to repel food from sticking to your dog’s teeth. This product is available at our clinic. NGAP is proud to be the first veterinary clinic in the United States to own a Biolase MD, the best dental laser currently on the market. This $75,000 state of the art technological product is gentle and can desensitize root-exposed teeth. Gingivitis exhibited by extensive redness and swelling of the gums, can also be treated with the Biolase MD. We can go into swollen gum tissue pockets and remove plaque and kill bacteria helping to stimulate the growth of healthy tissue, which can lead to the reattachment of the gum to the tooth root and accelerate healing. 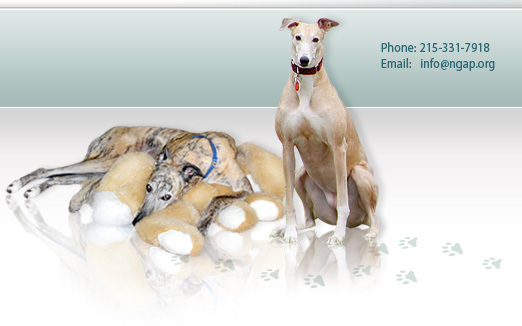 If your greyhound is in need of treatment using the Biolase MD, it is done during the cleaning process. Healing is fast with minimal or no pain. The standard charge is $50 unless extensive treatment is needed.